Sending and return crews or freight towards and from an orbiting space station. Return to earth of experiments results. Rescue vehicle of the orbiting space station for contingency returns on Earth. Going back and forth to the station during the same flight according to the shuttle's resources. Minimize the accelerations during the return (lower than 5g in nominal flight and lower than 12g in case of damage). Having components easy of use. Do not leave wastes in space. A conception from 30 to 40 years of life cycle. The decision to create a new return system is taken in 1994 by the group, V.A.Bolotin, V.E.Minenko, A.G.Reshetin, A.P.Skotnikov, A.N.ShChukin, of the NPO Energia company. The design of the new spacecraft is protected by a patent of August 5, 1994, under the term of "Spacecraft for the reentry in the atmosphere of a planet and method of reentry of a spacecraft in the atmosphere of a planet" under the number 2083448/RU. The general shape of the spacecraft is biconique with a flattened bottom. This bottom is the heat shield for the atmospheric reentry, it consists of three parts, the nose, the main zone and body flaps. 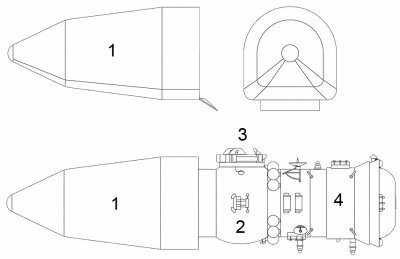 The nose shield is conical to protect the most part of the spacecraft front, the main zone is in charge of the lift of the spacecraft during the phase of the atmospheric reentry, both body flaps allows the pilot to drive the spacecraft during the atmospheric reentry. The landing of the spacecraft is made with a chute located in the upper part of the fuselage which makes it land horizontally, on the "belly". 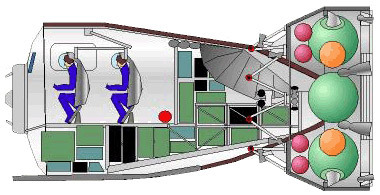 The capsule uses the principle of lifting bodies to fly. Addition of wings for a spacecraft is a loss of payload because wings are necessary only during the last phase of the flight, namely the atmospheric reentry. In the case of the lifting bodies the lift of the device is made by its body (the "belly") and not the wings so it results in an important mass benefit. The length of the device with the landing system with chute measured 6.2 m for a maximum diameter of 2.8 m. The basic variant included a crew of three people, the variant equipped with a rescue system could take up to seven people. The landing system was constituted by a responsive chute coupled with shock absorbers panels in honeycomb shape or an air cushion device. The spacecraft was equipped with a trapdoor at the rear (or on the right side) to enter inside the module, and with the androgin system APAS (similar to the Buran’s docking system). In the same way as on Buran the docking system APAS was perpendicularly settled from the axis of the capsule. Another version of the docking system was inspired by the one of Saliut and MIR, not pressurized this section was similar to the docking system of Soyuz but much lighter. Inside the service module was located the oxygen tanks, fuel, the propulsion engines (КДУ), the attitude engines (ДПО), the fuelling components, power supplies (chemical batteries). Outside were installed antennas (АФУ), the thermal heat exchangers (СОТР), the vertical infrared aim (ИКВ), and the solar arrays. The adjunction of a body flap behind increased the aerodynamics capacities of the spacecraft from 0 to 1.2 for speeds until Mach 6, as well as the angle of attack of 0° to 40°. The optimal regime is situated at 25°. The aerodynamic qualities were superior to that of Soyuz in particular for the manageability: the cross range in the orbit plan went to 5000 km and the lateral cross range up to 1500 km. The precision of the landing (inferior at 200m) allowed to use two nominal sites and three of rescue (in case of damage). The spacecraft was built for about twenty flights, but other elements weren’t reusable. After the end of the works on the return capsules in 1995, these features were used as a base for the elaboration of the Kliper spacecraft. At the beginning of the project (in the 2000s) the research works focused on the various possible reentry technics. 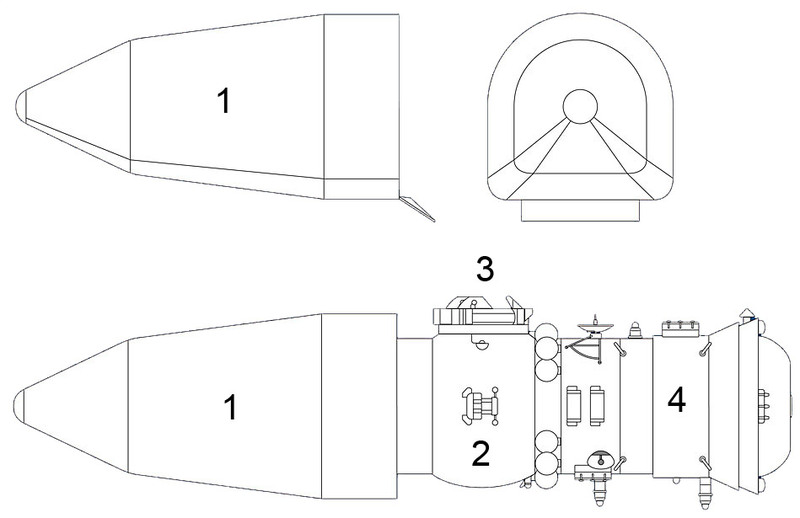 Axisymetric devices as the "Lighthouse" with vertical landing (with chute). Lifting bodies devices with vertical landing like the "BOR" (with chute). And winged devices of high aerodynamics qualities with horizontal landing (as a plane). After having compared the various typical technics the choice was made on the lifting bodies technology. Elaboration of the main requirements and the definition of the on-board systems. Study of the aerodynamic characteristics of the spacecraft as well as the service module. Study of the stability and the manageability. Choice of the actuators for the aerodynamic and responsive systems during the descent phase. Ballistic analysis of trajectories during the descent. Definition of the thermal characteristics and the choice of the materials for the thermal shield. Study of all the landing possiblities, choice and construction. Estimation of the technical characteristics for the construction and the exploitation of the spacecraft at the experimental factory of mechanical engineering (ЗЭМ), being a part of RKK Energia. The study and the analysis of the aerodynamic characteristics of the spacecraft, its stability and its manageability were studied at TsAGI during the period 2002-2003 (in wind tunnels). The mechanical stress tests took place in 2003 at TsIIMASH. The study on the chute systems was made in 2003 at the institute NII chute. The results of these studies (which were not in strictest secrecy) were very fast published in the medias and in particular on internet. In 1996 numerous studies were led in wind tunnels (in supersonic speeds) on the behavior of the MAKS shuttle. These studies aimed at defining profile of the fuselage with different wings configuration. In 2000 the definitive configuration was known with fixed wings, but it is funny to notice that these aerodynamics models were finally used for the elaboration of the Kliper spacecraft (one of the final models). Until 2003 all the studies on Kliper were financed by NPO Energia, but from this year the project was enough advanced to interest the Russian space agency which financed a part of the researches. At this moment the engineers having defined the global shape of the spacecraft were more interested on the internal layout and the location of the service module. This work is the most complex but also the most interesting. It was clear for the Energia’s engineers that to make a completely reusable system within that size and mass was impossible, it was necessary to limit the reusable part. To avoid the problem of overweight that the European shuttle Hermes encountered the Energia’s engineers decided that the spacecraft would be constituted by two functional parts of which one is disposable. The service module would be ejected after the breaking impulse just before the return in the atmosphere. This architecture is between the shuttle Buran (completely reusable) and the Soyuz capsule (single use). Two different locations of the service module were studied. A version with the module in front, on the nose, and another version with the module behind. 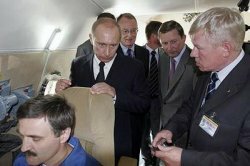 These two totally differents capacities required modifications of the spacecraft’s interior design, for example make the crew seats turn. 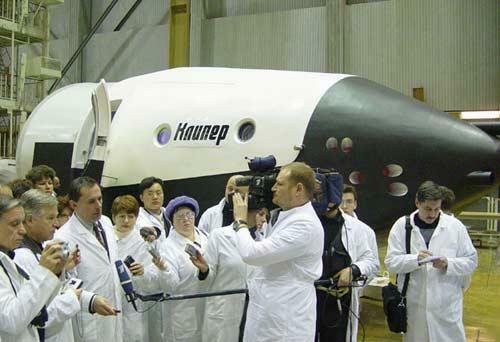 This configuration of Kliper (with the service module in front) was protected by its designers (J.P.Semenov, N.A.Brjuhanov, V.A.Bolotin, O.E.Makar' ev, N.K.Petrov, A.G.Reshetin, B.I.Sotnikov and V.V.Tsvetkov) by a patent numbered N2220077/RU on December 29th, 2001. However important features were still missing. 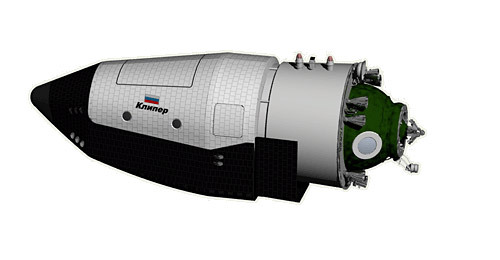 The initial configuration of Kliper was similar to that of Soyuz, the service module was attached behind the capsule. The module separated from the spacecraft before the return in the atmosphere thanks to explosive bolts. 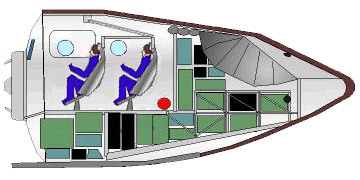 The crew consisted of three cosmonauts installed in seats, which could be turned of 30° to minimize the strengths during the re-entry following a long stay in the space. To be able to work in the space it was asked to add an airlock as well as a recovery system in case of a damage on the launcher. It was possible to add an airlock based on the one used in the Soyuz’s orbital module, the recovery system would also be based on a powder ejection tower. In that case Kliper looked more and more like the Soyuz, with a descent module of better aerodynamic and manageability, and the necessity of developing an escape tower more powerful (Kliper weights from 10 to 12 t). The solution was found by merging the service module and the orbital module in a single module (CAP) to allow spacewalks. In such a configuration the CAP module could remain on the rocket in case of damage, the recovery system taking only the return capsule apart. Now the spacecraft had a constant anatomy, the "nose" and the "tail" not changing during the various flight stages, the crew always looking forward. This position is not very comfortable and can lead to bad injuries during the return phase, that is why it was intended to turn the seats of 90° to modify the acceleration strength action from head-foot to breast-back. After having decided the general configuration of the spacecraft the following stage has consisted of the definition of the on-board systems, in the optimization of the flight capacities and weight by taking into account various use cases of Kliper. Approximately at the same period in the RKK Energia's subsidiary the consortium "Space Regate" proposed (in a energetic way because supported by the director of Energia Nikolay Sevast'janov) a new conception of the spacecraft which they named "Hybrid". 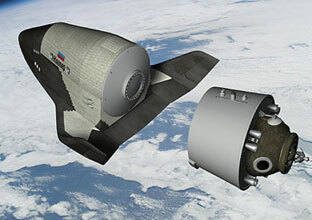 This spacecraft was the merge between two different concepts, the capsule and the shuttle. The principle was that wings would constitute a part of the heat shield during the descent and then would spread so that the vessel can flight as a plane. Miscellaneous variants were examined, 7, 12 and 20 tons with a crew from 2 to 8 people. But the works were stopped before the end of the technical proposition. February 17th, 2004 during a conference of the agency ITAR-TASS the chief executive officer of the Russian space agency J.N.Koptev spoke for the first time publicly about the Kliper project, by saying that Russia has been working on it since the beginning of 2000s. In 2004 RKK Energia began a deeper analysis of the on-board systems. Following it some changes were operated in the initial plan. A quite particular attention was put on the elaboration of the recovery system, on the attitude engines arrangement, as well as the choice of chemical batteries instead of the solar arrays. In the same period, research works were led by the research department of Sukhoi for a winged variant because it allows a sweeter return in the atmosphere. Indeed, the winged devices possess a higher aerodynamic quality in the hypersonic and subsonic flight which allows to limit loads on the crew during the descent in the atmosphere. Furthermore, the cross range is 2000 km and outfitted with wheels the spacecraft can land on an aerodrome. The landing on aerodromes makes the research services (ПСС) inherent with the capsules, and expensive, useless. The chute is also eliminated of the landing system (which must be replaced after every flight). Finally, the addition of (short) wings adds only very small weight to the spacecraft. The study of both variants, winged or not, is made in parallel, RKK Energia considering that the final choice will be made at the realization time. It is also this year which RKK Energia announces that Kliper will be capable of making interplanetary journeys, with some modifications it will be capable of travelling towards the Moon. This scenario was possible by adding a new stage during an on orbit rendez-vous to send the train to the direction of the Moon. This announcement, a little bit, vague made echo for the American decision to return on the Moon before 2020. For the first time the Kliper model was presented to the public on November 30th, 2004 in the test hangar of RKK Energia. It is also in this period that numerous technical datas were put at the disposal of the public whether it is for the winged version or the lifting body. In 2005 a decree of the government is signed (No. 635) to add Kliper in the Russian spatial program for period 2005-2015. But from this year Russia had difficulties to supply the 10 billion roubles necessary for the project and asks the assistance of the ESA. Negotiations failed some months after at the end of the year. On June 1st, 2006 RKK Energia stops any work on the project Kliper. Call for tender by the Russian space agency is closed without having determined the contracting party. 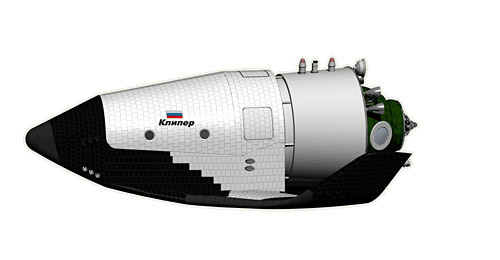 In May, 2008 Energia suggested a recapitulative comparative document between three versions of Kliper (lifting body, winged version and hybrid version), Soyuz and new version of a return capsule. This document shows that Energia did not completely abandon the idea of developing Kliper, but its future remains uncertain.